Free BlackBerry Speed Test | BlackBerry Blast! 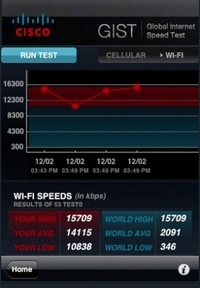 Cisco has released a free application that will test the speed of your BlackBerry Storm or iPhone / iPod Touch. The applications is named Global Internet Speed Test (GIST), and it allows you to test the speed of your devices network connection. "Cisco GIST Testing Methodology - The test is performed by downloading a known quantity of data from a single web server. The size of the data is different for the different types of network connections, so that the test will take roughly the same amount of time from the user�s perspective. For a cellular network test, 256KB are downloaded. For wireless, 512 KB are downloaded. A single download is performed, timed in milliseconds, and results are reported in terms of 1000 bits per second (kbps). Test results might be impacted by network routing, traffic, congestion and the responsiveness of our server. Results might also vary by the user�s geographical location."